Discussion in 'iPad Apps' started by 4phun, Apr 13, 2010. Ever since WolframAlpha realized their $50 mistake and dropped the price of their iPhone app to $2, it has shot into the app store top 25. They even offered those who purchased it at the higher price refunds. Now that WolfrramAlpha is actually affordable, this seemed like as good a time as any to review it. WolframAlpha offers a multitude of functions including plotting graphs, calculations and getting data for just about anything. It might be affordable now, but do you really need it? Lets find out. 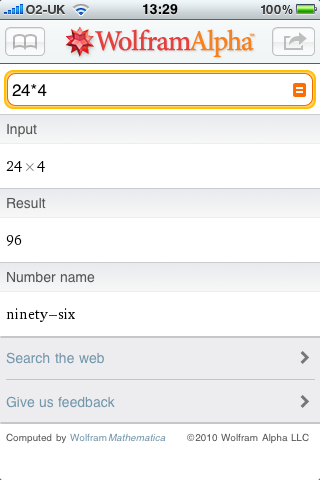 Listing features for WolframAlpha is difficult for one reason: it does everything. And I mean everything. Itâ€™s a calculator. Itâ€™s a music database. Encyclopaedia. Stock tracker. Dictionary. Currency converter. You get the idea. You name it, WolframAlpha does it. I honestly couldnâ€™t go through everything WolframAlpha does, so rather, Iâ€™ll go through how to use it. 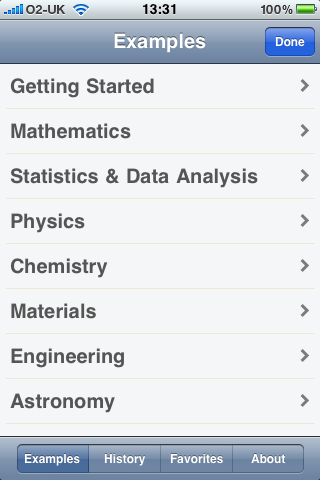 First off, WolframAlpha isnâ€™t search engine. â€˜How do I change the background color of my website?â€™ as a search term just isnâ€™t going to cut it. But, â€˜HTML Pinkâ€™ will show you the hex code, RGB code, complementary colors for pink and other shades of pink. Make sense? 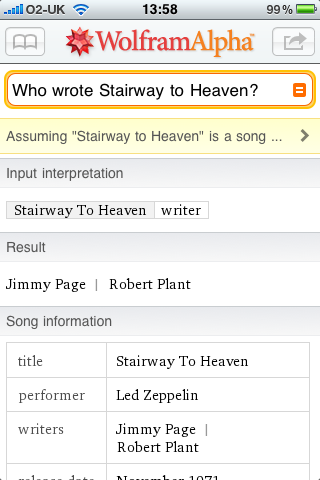 WolframAlpha gives information and data rather than links to web pages. 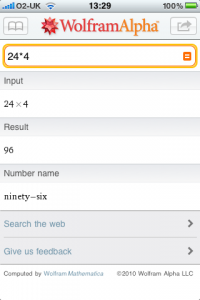 WolframAlpha has a custom keyboard for searching which includes the standard qwerty keyboard as well as numbers and symbols above that. 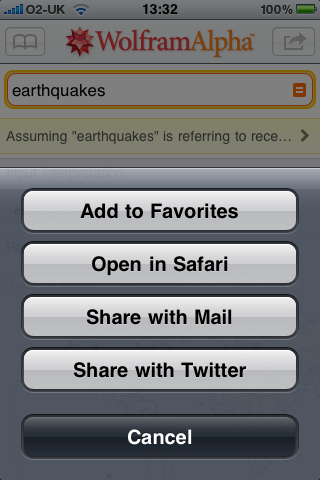 This gives you quick access to symbols that you would normally have to press the â€˜123′ button to get to. Once you have got the data you were looking for, your results are shown and they will likely include (depending on the data required) charts, graphs, tables, maps and images. You can expand most sections of the data to see more information and access similar data. Everything on the page is rendered as an image which can be saved to the camera roll, copied, shared on Twitter or emailed. You can also copy text from within an image for easy attaching to an email or sms. You can use data from a result as your next search, or â€˜inputâ€™. Similar to clicking on links to Wikipedia, youâ€™ll end up looking at data nothing to do with what you starting with (Six Degrees of WolframAlpha, anyone?). WolframAlpha also allows you to open results in Safari, add a specific search to favorites for easy access later as well as use an in-app browser to find out more about a specific subject. WolframAlphaâ€™s interface is simply beautiful and it seems every little detail has been thought out carefully. Having a custom keyboard is a great idea that I think more apps should use. Loading times are fasts, there are plenty of examples to get you started and data can be shared quickly and easily. 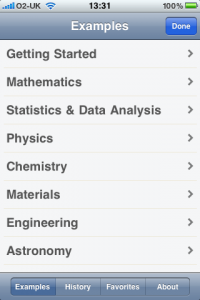 The in-app browser makes it easy to find out more information about a subject and favorites is organize in the same way as Safari for quick access to a subject. Whilst using WolframAlpha I only came across one issue. If you use it for an extended period of time, sections of results from previous searches sometimes become overlaid across the new results which can be fixed by restarting the app. This doesnâ€™t cause a massive issue but is annoying nevertheless. As I said at the beginning of this review, WolframAlpha really does everything. Whether youâ€™re a mathematician looking for a graphing calculator, a scientist looking for detailed chemical formulas or just someone who is constantly looking up facts and statistics, WolframAlpha has you covered. And at the new low price of $1.99 this app is a must buy.